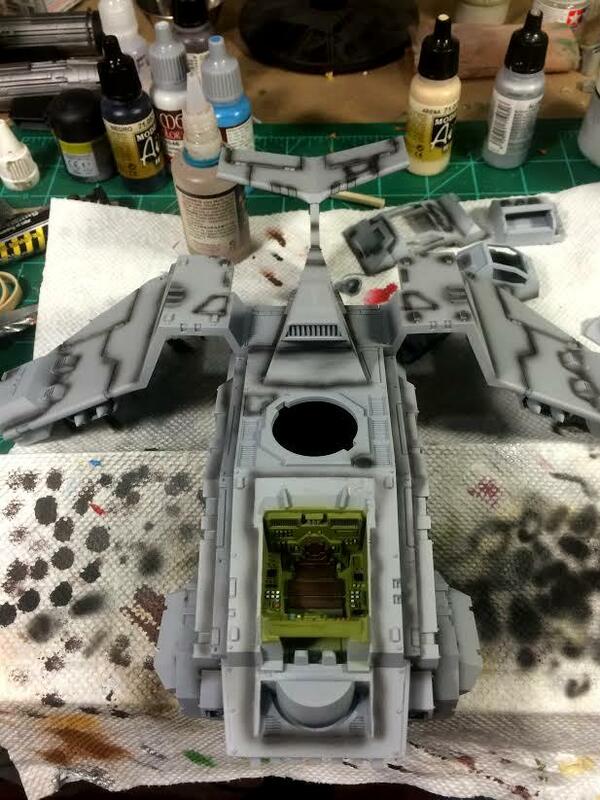 When we last left the Stormraven, a freshly laid coat of Tamiya Surface Primer was drying on the model. After it was cured, I used some Tamiya Liquid Surface Primer to fix a couple of spots I was unhappy with and after it was sanded down I reapplied some primer over the areas in question. After that, it was time for some preshading with VMA Black. Preshading is a technique that makes use of the idea that an airbrush applies thin layers of paint. By darkening areas of the model with your desired color, you can affect the color of the basecoat by allowing some of the preshaded areas to show through the top coat. This can be adjusted depending on how much paint is applied on the topcoat. The result is subtle shading on the model that can bring depth to panel lines and shadows. 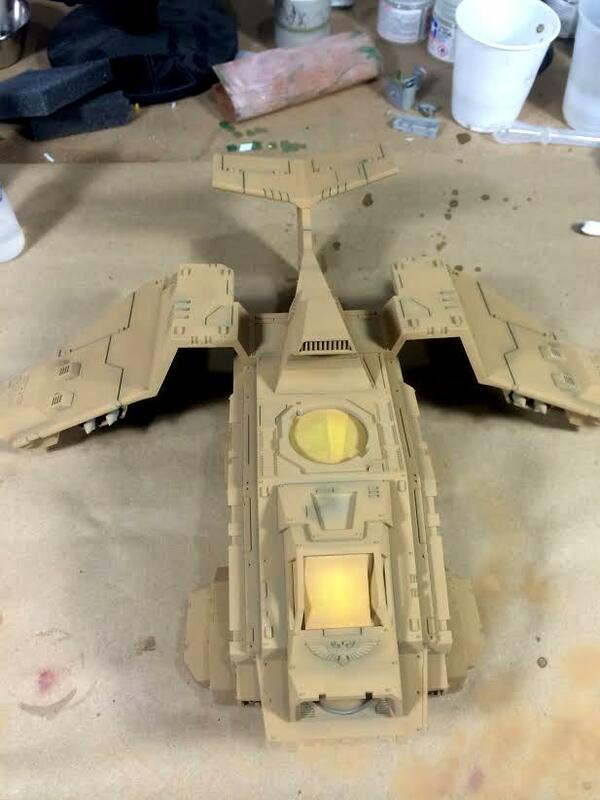 I then laid down the base color, again using Tamiya Desert Yellow (XF-59) like the Stormtalons that will be on the tabletop along with this model. Tamiya paints airbrush extremely smooth and leave an extra matte finish; the only downside is that they model is vulnerable to fingerprints, making gloves a necessity. 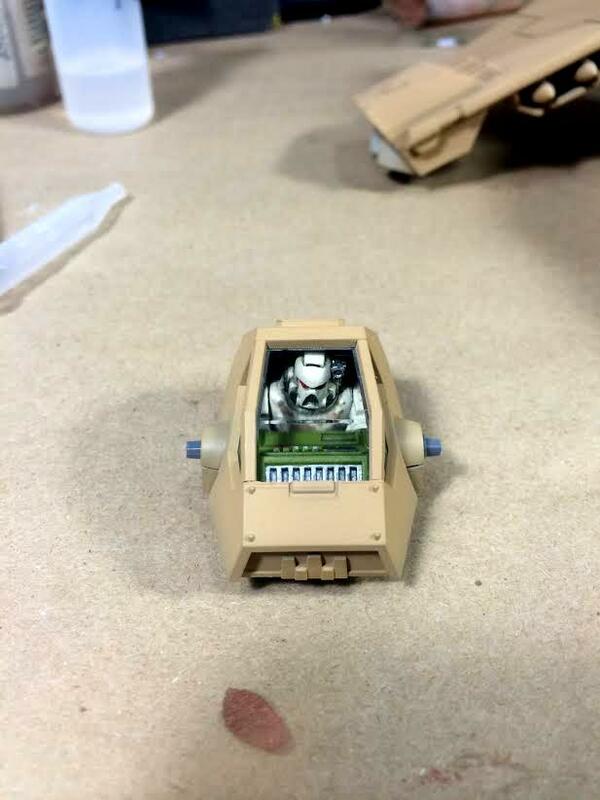 The client also requested a slight conversion to the model: replace the gun servitor in the turret with a Guardsmen or marine. I agree that it makes little sense that space marines would use a mindless servitor to man the gun on a craft like this. I raided my bits box and after some heavy modification, I managed to cram a space marine into the gun turret. The engines and other metallic details were painted using a 1:1 mix of VMA Aluminum and VMA Black and along with the rest of the model, are awaiting a coat of Future in preparation of an oil wash and weathering. Looking really good man. Are you using the Tamiya alcohol based acrylics or the enamel? I use Tamiya acrylics (X-colors and XF-colors). As far as I know, they only offer those acrylics and lacquer sprays, which I've never used but I've heard are quite nice. I've started using them because of all of the Star Wars models I've been working on, and I really enjoy them. They spray super smooth and never clog the airbrush.